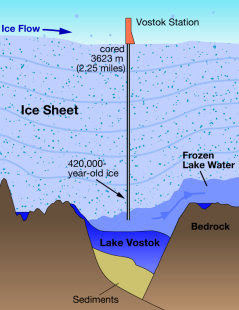 Lake Vostok (Russian: восток, "east") is the largest of more than 140 subglacial lakes found under the surface of Antarctica. It is located beneath Russia's Vostok Station, 4,000 meters (13,000 ft) under the surface of the central Antarctic ice sheet, within the Australian Antarctic Territory. It is 250 km long by 50 km wide at its widest point, thus similar in size to Lake Ontario, and is divided into two deep basins by a ridge. The water over the ridge is about 200 m (650 ft) deep, compared to roughly 400 m (1,300 ft) deep in the northern basin and 800 m (2,600 ft) deep in the southern. Lake Vostok covers an area of 15,690 km² (6,058 mi²). It has an estimated volume of 5,400 km³ (1,300 cubic miles) and consists of fresh water. The average depth is 344 m. In May 2005 an island was found in the center of the lake. Airborne ice-penetrating radar data first showed lakes beneath the Antarctic ice-sheet in the late 1960s and early 1970s. The existence of Lake Vostok was first noted in 1973 by scientists of the Scott Polar Research Institute, but not named by them. Russian and British scientists delineated the lake in 1996 by integrating a variety of data, including airborne ice-penetrating radar imaging observations and spaceborne radar altimetry. It has been confirmed that the lake contains large amounts of liquid water under the more than three-kilometer thick icecap, promising to be the most unspoiled lake on Earth. Its water is very old, with a mean residence time in the order of one million years (as compared with six years for Lake Ontario, which is typical for lakes of that size). The average water temperature is around −3 °C (27 °F); it remains liquid below the normal freezing point because of high pressure from the weight of the ice above it. Geothermal heat from the Earth's interior warms the bottom of the lake. The ice sheet itself insulates the lake from cold temperatures on the surface. Researchers working at Vostok Station produced one of the world's longest ice cores in 1998. A joint Russian, French, and U.S. team drilled and analyzed the core, which is 3,623 metres (11,890 ft) long. Ice samples from cores drilled close to the top of the lake have been analyzed to be as old as 420,000 years, suggesting that the lake has been sealed under the icecap for between 500,000 and more than a million years. Drilling of the core was deliberately halted roughly 100 metres (300 ft) above the suspected boundary where the ice sheet and the liquid waters of the lake are thought to meet. This was to prevent contamination of the lake from the 60 ton column of freon and aviation fuel Russian scientists filled it with to prevent it from freezing over. From this core, specifically from ice that is thought to have formed from lake water freezing onto the base of the ice sheet, evidence has been found, in the form of microbes, to suggest that the lake water supports life. Scientists suggested that the lake could possess a unique habitat for ancient bacteria with an isolated microbial gene pool containing characteristics developed perhaps 500,000 years ago. Since Lake Vostok consists of two separate basins divided by a ridge, it has been suggested that the chemical and biological compositions of these two ecosystems are likely to be different. Lake Vostok is an oligotrophic extreme environment, one that is supersaturated with oxygen, with oxygen levels 50 times higher than those typically found in ordinary freshwater lakes on Earth. The sheer weight of the continental icecap sitting on top of Lake Vostok is believed to contribute to the high oxygen concentration. Besides dissolving in the water, oxygen and other gases are trapped in a type of structure called a clathrate. In clathrate structures, gases are enclosed in an icy cage and look like packed snow. These structures form at the high-pressure depths of Lake Vostok and would become unstable if brought to the surface. No other natural lake environment on Earth is as rich in oxygen and it is speculated that any organisms inhabiting the lake would have needed to evolve special adaptations to survive. These adaptations to an oxygen-rich environment might include high concentrations of protective enzymes. Due to the lake's similarity to the Jupiter moon Europa and Saturn's moon Enceladus, any confirmation of life living in Lake Vostok would strengthen the prospect for the possible presence of life on Europa or Enceladus. In April 2005, German, Russian, and Japanese researchers found that the lake has tides. Depending on the position of the Sun and the Moon, the surface of the lake rises between 1 and 2 cm. The researchers assume that the fluctuation of the lake surface has the effect of a pump that keeps the water circulating, which would be necessary for the survival of microorganisms if there are any. To probe, without contamination, the waters of Lake Vostok for life, plans were initiated in 2001 by the Jet Propulsion Laboratory to start with a melter probe — the so-called "cryobot" — which melts down through the ice over Lake Vostok, unspooling a communications and power cable as it goes. The cryobot carries with it a small submersible, called a "hydrobot", which is deployed when the cryobot has melted to the ice-water interface. The hydrobot then swims off and "looks for life" with a camera and other instruments. In January 2006, Robin Bell and Michael Studinger, Geophysical researchers from Columbia University, announced in Geophysical Research Letters the discovery of two smaller lakes under the icecap, named 90 Degrees East and Sovetskaya. It is also suspected that the Antarctic subglacial lakes may be connected by a network of subterranean rivers. CPOM glaciologists Duncan Wingham (University College, London) and Martin Siegert (University of Bristol, now University of Edinburgh) published in Nature in 2006 that many of the subglacial lakes of Antarctica are at least temporarily interconnected. Because of varying water pressure in individual lakes, large, sub-surface rivers may suddenly form and then force large amounts of water through the solid ice.